The goal of the project “Network of Knowledge” (runtime 2012-2015, FWF project number P 24400-G15, main researcher: Bernhard Hurch) appears to be very linear at first sight: the online, open access presentation (and consequent analysis) of the papers of Hugo Schuchardt (1842-1927), combining the digital facsimile edition of all of Schuchardt’s publications with the also digital edition of his correspondence and a bibliography of secondary literature. Preserved at the University’s library in Graz, the Hugo Schuchardt Papers account for nearly 14,000 letters received from virtually all over the world. The actual tally for the digital edition of Schuchardt’s correspondence is at the moment (May 2015) around more than 2,000 edited letters. Furthermore, all of Schuchardt’s works (a growing number of them also as OCR scanned searchable PDFs) are already available for consultation, together with an ever increasing collection of more than 315 reviews, which are being processed and will be put online. In order to allow the connection between different kinds of sources, an over-arching search tool is being developed, composed of a controlled vocabulary (thesaurus) for source document tagging. For example, a letter, a publication, and a review can be linked through the keyword ‘Neo-grammarians’ or ‘French-based creole languages’. The analysis of these sources will provide the means to reconstruct the scientific network developed during the second half of the 19th century in the language sciences along the lines of the following hypothesis (cf. also Hurch 2009): innovations that occurred in 19th-century (communication) media, such as a) the formation of a modern global system of postal services and b) the creation of modern printing and publishing companies, followed by the foundation of scientific periodicals, are interrelated with changes in the language sciences, e. g. the opening of new fields of research, the establishment of new scientific discourse practices, new ways of obtaining knowledge, and a differentiation of scientific disciplines, coupled with their institutionalization in universities or scientific societies. Source: Brockhaus’ Konversations-Lexikon (1894-1896). 14th edition. Leipzig: Brockhaus. The world wide web of postal service enabled the global movement of goods, capital, and knowledge. In the 19th century, the amount of posted mail exploded. The necessary preconditions were not only infrastructural and technical developments, such as the railroad network across Europe or the growing number of public postboxes, but also organizational innovations; for example, the development of postage, which went from the first stamp in the modern sense in 1840 (“One Penny Black” in Great Britain) to the foundation of the World Postal Union in 1874 (as “General Postal Union”) in Bern, which established rules for an international postal service. A growing number of new journals could well be simultaneously the cause and consequence of the increased use of new technologies in the printing of periodicals, thus enabling a larger number of copies and an accelerated rhythm of publication. In addition, the new process of pulping wood fibers, which made paper an object of mass production, also contributed to this outcome. In this context, researchers and publishers became entrepreneurial partners. One could say that this was a Gründerzeit – a “Founder’s Era” – in modern language sciences. There is a whole generation of researchers, mostly born in the 1840s or later, who established periodicals from the late 1860s onward. Names like those of Gaston Paris and Paul Meyer (who founded the Romania in 1872), Graziadio Ascoli (Archivio Glotologico Italiano, 1872), Adalbert Bezzenberger (Beiträge zu Kunde der Indogermanischen Sprachen or “Bezzenberger’s Beiträge”, 1877) or Gustav Gröber (Zeitschrift für romanische Philologie or “Gröber’s Zeitschrift”, 1877) represent a European phenomenon that affected all disciplines of the language sciences (see Tagliavini 1968: 132-135). All of these founder-editors were in more or less frequent epistolary contact with Schuchardt. There are two possible approaches for a historiographic investigation into the interrelationships between these developments. On the one hand, there is the classical qualitative or hermeneutic approach of interpreting the content of the sources, e.g. the linguistic data, bibliographical references they contain, or whether they represent polemics, comments, descriptions or wrong conclusions. On the other, there is a quantitative or statistical approach for investigating metadata, which is used a lot in the Digital Humanities. Metadata don’t lie: the fact that a letter was sent from one person to another at a certain time is a historical fact quite separate from the content of the letter. Using both methods on the Hugo Schuchardt Papers, one finds strong arguments for the hypothesis sketched above. One example for the qualitative method: on September 12th 1886, Schuchardt wrote to Otto Jespersen (consult the letter here) having just read and positively reviewed an article written by the Danish linguist (Jespersen 1886) in the Deutsche Litteraturzeitung (Schuchardt 1886). Jespersen had asked Schuchardt if he would be in favour of a German translation, to which Schuchardt not only approved, but went on to recommend a journal that reached a wider circulation and a greater audience, along with a journal that had no Neo-grammarian as a founder-editor. In addition, Schuchardt stressed that time is a key factor, since every new development in the ongoing debate between the Neo-grammarians and their critics was being brought up nearly every month in 1886 (Hurch & Constantini 2007). 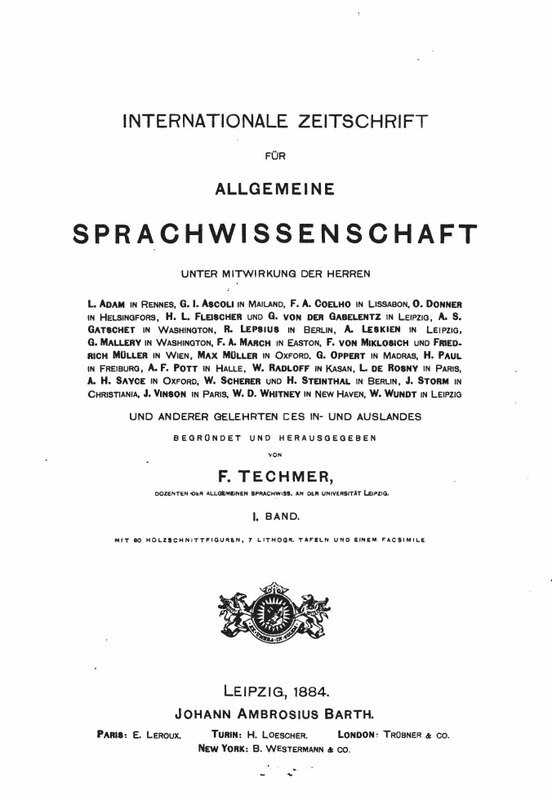 In the end, the translation (Jespersen 1887) was published in 1887 in the Internationale Zeitschrift für allgemeine Sprachwissenschaft (or “Techmer’s Zeitschrift”). Front page of Techmer’s Zeitschrift for 1884. 1st volume. Using the quantitative approach, it is possible to give structural information about Schuchardt’s contacts to the scientific journals of his time. Schuchardt corresponded to a great extent with those founder-editors in whose periodicals he published a lot, for example with Gröber (160 received letters, 288 articles and 9 reviews in “Gröber’s Zeitschrift”), and where his works were reviewed quite often (12 reviews). Another argument making a strong case for the connection between communication, publication, and reception is the fact that Schuchardt did not receive many letters from those founder-editors in whose periodicals he did not publish. Subsequently, Schuchardt was not much reviewed in those same periodicals. While this seems to be quite obvious, there are indications of anomalies: Schuchardt maintained an extensive mail exchange with Gaston Paris (98 received letters), but he published only 9 articles in the Romania – despite having his works reviewed 19 times in that periodical. Moreover, even though there was intensive epistolary contact between Schuchardt and Ascoli (139 received letters; cf. Lichem & Würdinger 2013), Schuchardt neither published anything in the Archivio Glottologico Italiano, nor had he any of his work reviewed there. But both Paris and Ascoli were part of Schuchardt’s network of knowledge: by comparing the epistolary inventories, one establishes the fact that Ascoli and Schuchardt have 130 common correspondents, and Paris and Schuchardt as many as 175. All this resulted in a broad variety of new types and specific modes of reference: if on one side there is mixing of text forms, on the other there is also merging of text forms. We see an entanglement of text forms: how very often the scientific discourse is not limited to one specific text form, but continues over a variety of different communication media (letters, reviews, replies, postscripts, etc.). 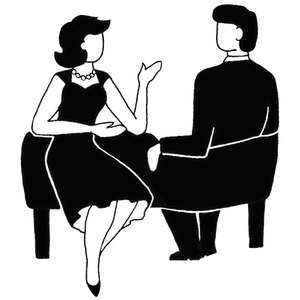 Some discussions alternate between different discourse forms (cf. Mücke 2015). Another phenomenon we observe is the amalgamation of text forms: how boundaries between public and private text forms become blurred. Several transitional text forms can be found: scientific publications in the form of letters, letters published as scientific essays, open letters, letters to the editor or even personal dedications. Another instance supporting the assumption that the network of language sciences at the turn of the 19th century was indeed international is the advisory board of several periodicals. 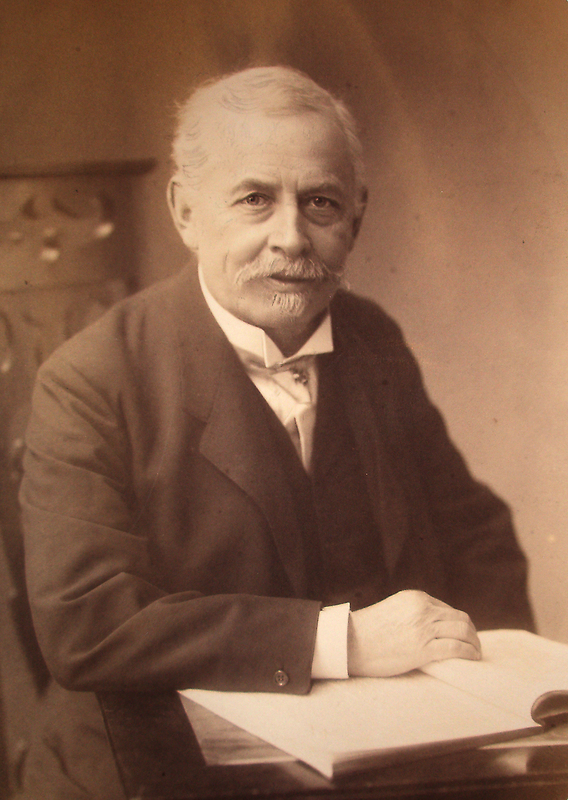 Ascoli, Coelho, Gabelentz, Lepsius, Pott or Miklosich – all of them part of the advisory boards of “Techmer’s Zeitschrift” – are present with letters in Schuchardt’s legacy. But, also important, they stood presumably in postal contact with each other. So, it should be quite clear by now that the current project “Network of Knowledge” not only stands for itself, but can also be seen as preliminary groundwork for a joint investigation of the linked networks of knowledge in Europe at Schuchardt’s time. This blog entry is partly based on a presentation held by one of the authors together with Bernhard Hurch at the International Conference of the History of the Language Sciences (ICHoLS) 2014 in Vila Real. The authors would like to thank Bernhard Hurch for his support and advice in the project work. Hurch, Bernhard & Francesco Costantini. 2007. “Die Korrespondenz zwischen Otto Jespersen und Hugo Schuchardt”. In Bernhard Hurch (ed.) (2007-). Hugo Schuchardt Archiv. Online: http://schuchardt.uni-graz.at/korrespondenz/briefe/korrespondenzpartner/516 (4.5.2015). Hurch, Bernhard. 2009. 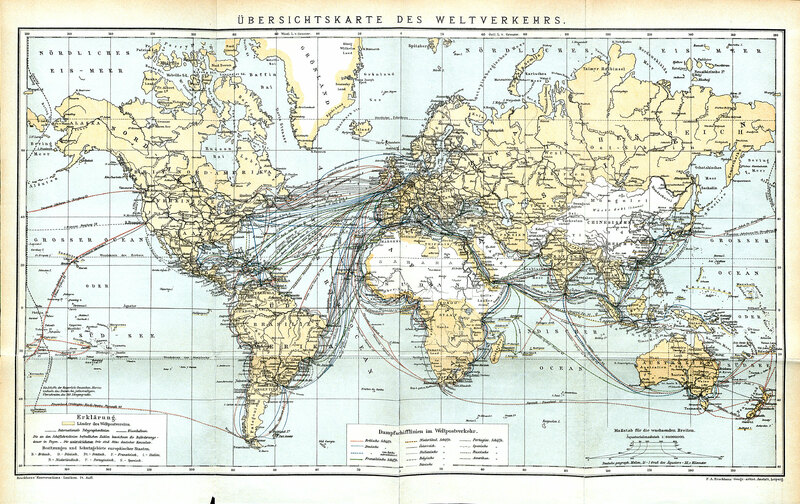 “Bausteine zur Rekonstruktion eines Netzwerks I: Einleitung – Prolegomena”. In: Hurch, Bernhard (ed.). Bausteine zur Rekonstrukion eines Netzwerks I: Caroline Michaëlis, Elise Richter, Hugo Schuchardt und Leo Spitzer. Graz: Institut für Sprachwissenschaft (= Grazer Linguistische Studien 72), 5-17. Jespersen, Otto. 1886. “Til spörgsmålet om lydlove”. In Nordisk tidskrift for filologi. Ny Række 7: 207-245. Jespersen, Otto. 1887. “Zur Lautgesetzfrage”. In Internationale Zeitschrift für allgemeine Sprachwissenschaft 3: 188-216. Lichem, Klaus & Wolfgang Würdinger. 2013. “Die Korrespondenz zwischen Graziadio Isaia Ascoli und Hugo Schuchardt”. In Bernhard Hurch (ed.) (2007-). Hugo Schuchardt Archiv. Online: http://schuchardt.uni-graz.at/korrespondenz/briefe/korrespondenzpartner/254 (4.5.2015). Mücke, Johannes. 2015. “‘… unsere freundschaftlichen Beziehungen…’. Zum Verhältnis von Hermann Paul und Hugo Schuchardt”. In: Melchior, Luca; Mücke, Johannes (eds.). Bausteine zur Rekonstruktion eines Netzwerks IV: Von Diez zur Sprachanthropologie. Graz: Institut für Sprachwissenschaft (= Grazer Linguistische Studien 80), 125-164. Schuchardt, Hugo. 1886. “[Rez. von:] Otto Jespersen, Til spörgsmålet om lydlove; Jakob Hornemann Bredsdorff, Om Aarsagerne til Sprogenes Forandringer. Paa ny udgivet af Vilh. Thomsen”. In Deutsche Literaturzeitung 7: 1557-1559 (HSA 197). Online: http://schuchardt.uni-graz.at/werk/online/548 (4.5.2015). Tagliavini, Carlo. 1968. Panorama di storia della linguistica. Bologna: R. Patron. Zappa, Frank. 1979. “Packard Goose”. In Joe’s Garage, Act III. Zappa Records. A most interesting connection (Jespersen/Schhardt). Bi the bye, is there any specific reference to the use of ‘lingua franca’ in the Schuardt papers, or in his Pidgin and Creole approaches? Thanks!